WINSTON-SALEM, N.C. (March 22, 2019) - The Dash's 10th anniversary season at BB&T Ballpark will begin Thursday, April 11. 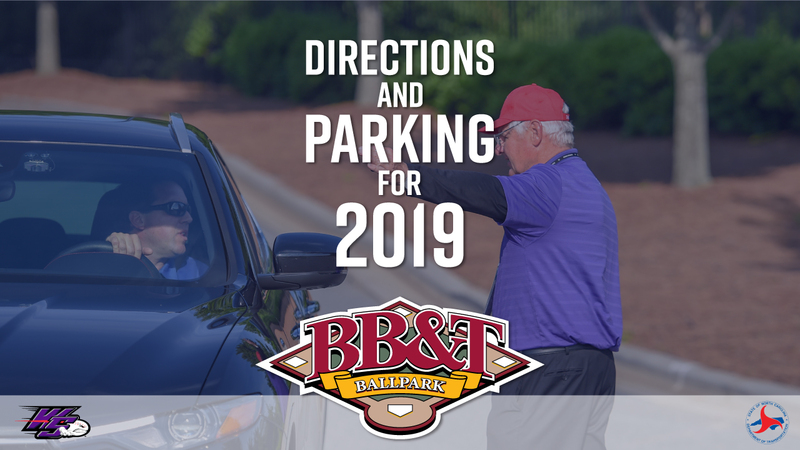 As the organization prepares to celebrate this monumental milestone, the team has revealed new traffic plans to provide fans easy access to BB&T Ballpark. There is a 1.2-mile stretch of Business 40 near the ballpark that will be closed during the 2019 season. By taking advantage of the recommended traffic patterns below, fans can best avoid any delays in their normal ballpark commute. From the North (VIDEO): Merge onto US-52 S. Take Martin Luther King Dr. and take a left onto Marshall St. until you get to Fifth St. and take a right. Follow Fifth St. to Broad St. and take a left. Take the Broad St. entrance on the right into the ballpark. From the East (from Business 40 Westbound) (VIDEO): Merge onto US-52 S. Take Research Pkwy exit. Turn right onto Research Pkwy. Turn left onto City Yard Dr. then continue on to Salem Ave. Take a right on Broad St. then crossover Business 40 Bridge. Take the Broad St. entrance on the left into the ballpark. From the West (VIDEO): Merge onto I-40 E. Merge onto Business 40 E/US 421 S will come to an end at the Peters Creek Pkwy Exit, Exit 5A. Take Peters Creek Pkwy Exit and turn right at the light. Follow Peters Creek to Broad St. and take a right. Crossover First St. and then take the Broad St. entrance on the right into the ballpark. From the South (VIDEO): Merge onto US-52 N. Merge onto I-40 W via Exit 109B. Take Peters Creek Pkwy exit, Exit 192. Turn left onto Peters Creek Pkwy for three miles. Take a right on Broad St. and crossover First St. Take Broad St. entrance on the right into the ballpark.